The image is drawn onto the lino surface in ball point pen (this won't wash off during cleaning). As this is a "reduction" print that uses just one block and a process of overprinting to produce a complete range of tones and colours, the size of the edition needs to be predetermined. It is also important to remember that the print will be reversed, especially if the composition includes text! Using the graving tools, all the areas of the print surface to remain the colour of the paper surface (in his case, white) are removed to a depth of at least 1mm. in the case of fine lines and up to 4mm. for larger areas. Progress can be monitored by using computer printer paper and soft pencil to take ‘rubbings’ of the lino surface. Having removed all the areas of the lino surface corresponding to areas of the background surface colour, the block is ready for the first print colour. In this case, a pale blue. The required hue of blue is mixed on a glass block using oil-based printing inks. A small amount of a reducing medium is also added to aid application and as, (a personal preference of mine), a means to make the ink transparent without reducing the strength of hue. This allows for extra shades and hues by careful combinations of different layers of ink. The ink is rolled onto a separate impermeable surface before applying it to the lino. This is to achieve a smoother, more even consistency. 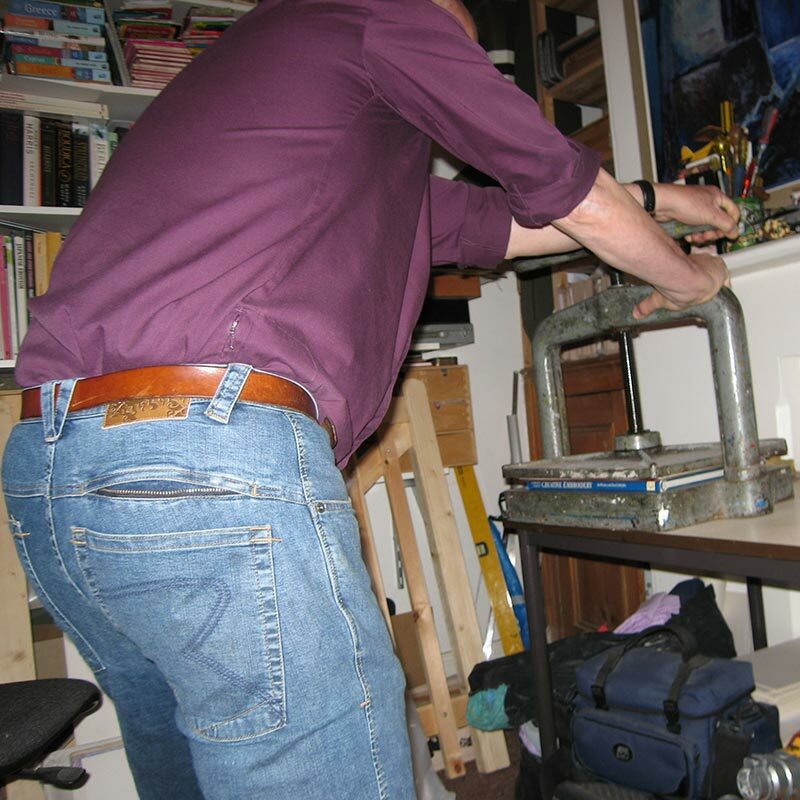 I usually apply pressure by using an old book binding press; accommodating prints up to 30x40cms in size. A ‘sandwich’ is created of a firm, absolutely flat board, 5 packing layers of newsprint, a fine felt blanket, the print paper and inked block. Different qualities of print can be achieved by varying the packing materials. Alternatively, usually on thinner printing papers or textiles, the ink can be transferred to the print surface by burnishing the back of the print with a baren, or even the back of a spoon! Having printed the first colour for the full edition, areas of the lino corresponding to those on the print that are to remain that first colour are cut away from the lino block. The second colour is then mixed (in this case a medium blue) and applied as before to the lino block which is the registered by eye on top of the first colour prints. The printing process is as before. Mechanical methods of registration are available but as my print editions are usually limited to 10 or fewer, registration ‘by eye' and crosshair lines on two corners works for me! Extra tones can be achieved, as demonstrated here, by thinning or removing small quantities of ink from the block using ‘Q-tips’ or a cotton cloth wrapped around a blunt pencil. Areas to remain the second shade of blue are removed from the lino surface and a third colour is introduced, being registered and printed exactly as before but now on top of the two shades of blue already printed. Again, small areas of green are removed or thinned from the surface of the inked block to increase the range of tones and hues. 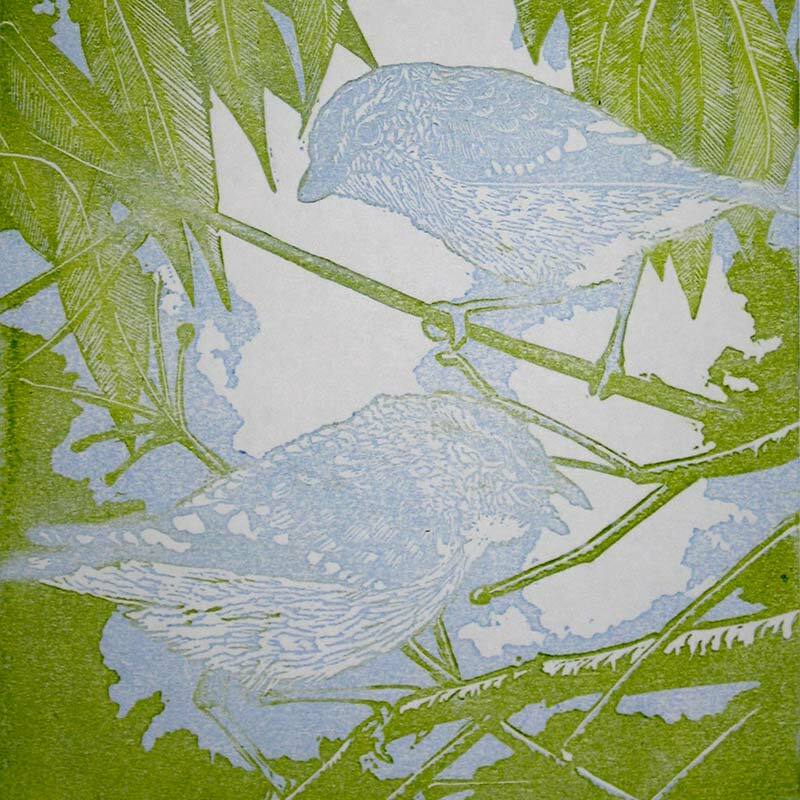 Having removed areas of the lino corresponding to those of the print to remain light green, a third shade of blue is now introduced to give increased form to the birds and, because the ink is transparent, green shadow to the foliage. Having removed areas of the lino corresponding to those of the print to remain darker green and medium blue, a much darker blue is introduced to give final definition to the birds and the twigs. To give this final print colour greater strength the amount of reducing medium used is, itself much reduced to give greater opacity to the colour.